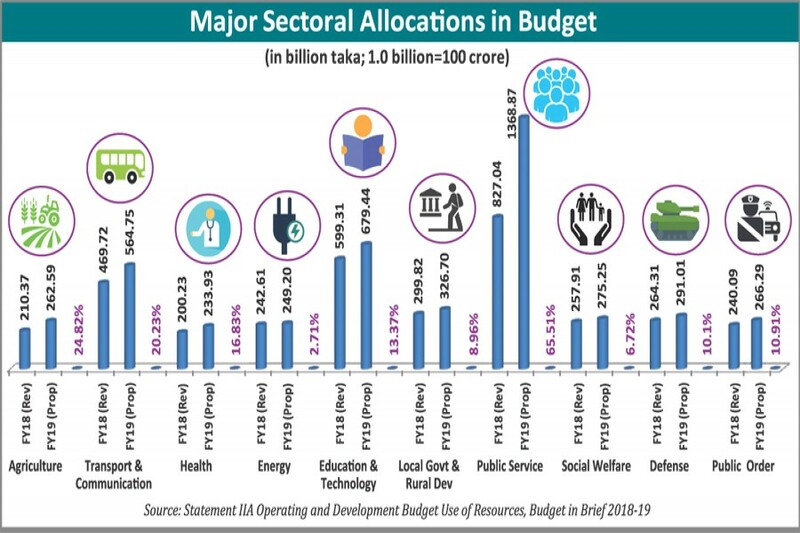 The allocation for the agriculture sector in the proposed budget for fiscal year (FY) 2018-19 has declined further. As per the proposed budget, the allocation for the farm sector has dropped to 2.99 per cent from 3.40 per cent in FY 2017-18, a decrease of 0.41 per cent. The allocation was 6.39 per cent in FY '14 while 4.95 per cent in FY '15, 4.47 per cent in FY '16 and 3.78 per cent in FY '17. For FY '19, the government has allocated Tk 139 billion for the agriculture ministry. According to the Ministry of Agriculture (MoA) data, the contribution of the sector to the Gross Domestic Product (GDP) has also been declining. The sector's contribution to the country's GDP (constant price and base year FY 2005-06) came down to 14.11 per cent in FY '18 from 14.72 per cent in FY '17. The growth of the sub-sector (crops and vegetables) was less than 1.0 per cent in the outgoing fiscal year in terms of the GDP. Expressing their concern, experts said expenditure on the farm sector should be raised for the sake of food security. Professorial Fellow at Bangladesh Institute of Development Studies (BIDS) Md Asaduzzaman said the crop sector saw its growth rate declining due to two spells of floods last year. Floods caused severe damage to paddy and the production of vegetables also affected. The government had to import 3.95 million tonnes of rice worth US$ 1.6 billion this fiscal year due to a plunge in its production, he said. "Output in the current Boro season is good, but the farmers are not getting even their production costs." The farmers should receive more compensation this fiscal year as they lost everything to the two spell of floods. Mr. Asaduzzaman said the allocation farmers should be increased to help ensure food security in the country. Centre for Policy Dialogue (CPD) director (research) Khandoker Golam Moazzem said more than 2.5 million farmers switched to other professions from agriculture in the last five years, finding it non-profitable. Both subsidy and allocation for the agriculture sector have been declining in terms of the country's GDP and total budget, he said. The government should raise the allocation for farmers to encourage them to stick to agriculture, he added. He said the fisheries and livestock sector showed better performance in the last few years. The government should also provide incentives to fisheries, poultry and cattle farmers to boost output, he added.